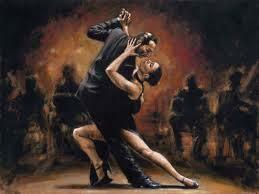 Tango is a passionate, seductive and mesmerizing dance, also know as the dance of love. It's characterized by quick, sharp movements, snappy dynamic, and a close chest-to-chest embrace. Today, it's one of the most popular dances in the world, enjoyed by young and old alike. In this article we will take a look at some historical facts about tango. Tango was born in the working-class neighborhoods of Buenos Aires, Argentina in the late 19th century. It first sprang to life in the brothels of Buenos Aires where the girls danced with their clients. It soon gained popularity with more established circles and moved to dancing houses where it was quickly absorbed into mainstream society. Tango was introduced to Europe at the beginning of the 20th century. It is known that in 1909 it was danced on stage in Paris. After 1912, tango spread all over the world and the international tango craze began. Although there are many theories and opinions on where did the word tango come from, it's most probable that it comes from Latin word tango or Portuguese word tangere. The translation of both words is - to touch. Quite appropriate, I would say. Today, many different styles of tango exists: Tango Argentino, Ballroom Tango, Tango Oriental, Tango Canyengue, Tango Liso, Tango Salon, Tango Orillero, Tango Apilado, Tango Nuevo, Finnish Tango, Chinese tango, and so on. The two main styles are Argentine and American ballroom style. The basic tango is not so difficult to learn. The basic step consist of five steps taken to the 8 counts of music. The rhythm is slow, slow, quick, quick, slow. Tango is danced to music written in 2/4 or 4/4 timing. It's usually 4/4 - 4 beats to a bar of music. Today, tango is still very popular and danced all over the world. One of the main reasons why is the ease of learning. And because it's sensual, passionate, and very worth trying.